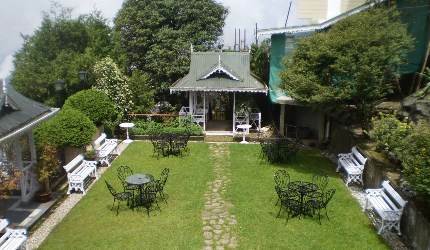 If you are looking to enjoy the serenity of Darjeeling and its magnificent views from a quiet corner of the hills, Cedar Inn can be a great choice. This boutique hotel with its 4 star luxury amenities is perched on a hill on Jalapahar Road and is at a higher altitude than the Mall or the town center. The Chowrasta Mall is not exactly at a walking distance from the hotel. While you can walk it in about 30 minutes, the walk back is quite steep and can be tiring. The hotel provides a free shuttle for drops and pick ups at the town center. Cedar Inn was built in 1999 and is owned by a company dealing in lands and estates. Zakir Hussain Road from the Mall leads up to the Jalapahar Road where the hotel is located. There is a large iron gate at the entrance to this attractive property. From the outside, the main hotel building has a Victorian look with all the rooms having large bay windows. Inside there are extensive wood work and paneling done giving a charming and warm ambience. As you walk in to the main building, the reception counter is on the left. 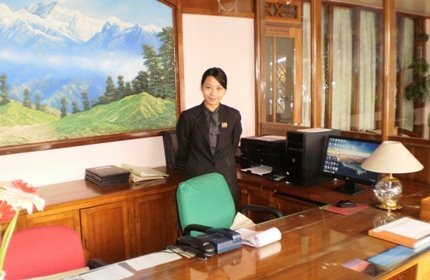 The Front desk staff and the waiters have been trained to be courteous. Amit, the front desk manager has been working in the hotel for more than 6 years and is happy that he has chosen this hotel for his career. I found him and his assistant lady very professional, pleasant personalities and helpful. Opposite to the reception is an impressive lounge area with a glass ceiling and wooden beams. There are comfy sofas here with center tables. This area is wi-fi enabled and you can have free high speed wireless internet access from your laptop. 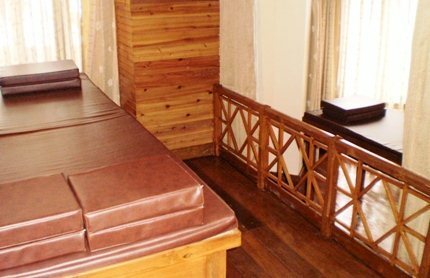 There are 29 rooms in Cedar Inn, out which there are few Executive and Observatory suites which are more expensive and obviously better in terms of interior decor, amenities etc. Otherwise all rooms are similar in design. 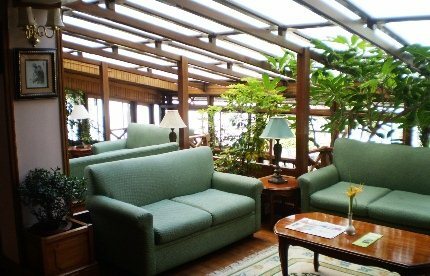 In most of the floors, there is a separate lobby with nice seating arrangement where one can relax, have tea and read news papers and magazines. There are few cottages as well. Update March 2014: A new building has been added with several more rooms including family rooms at the ground floor and a children's play ground in front. There is also an indoor playroom and other indoor recreational activities for kids. Rooms are wood paneled and have wooden floor. There is a small dressing area in the room. The best part of a room is the curved bay window and the seating arrangement next to it. You can open the windows. 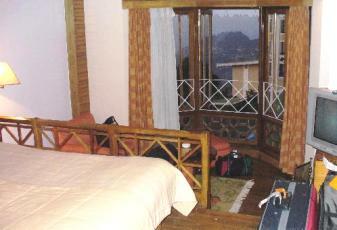 Most of the rooms have marvelous views of the Kanchenjunga and the Eastern Himalayan Range. On a clear day, you can clearly see the dazzling snow peaks from the room. This is probably the single best reason for choosing this hotel. All rooms have color television (not LCD though) with cable channels. Most of the rooms have their own fireplace, phones with STD/ISD facility etc. 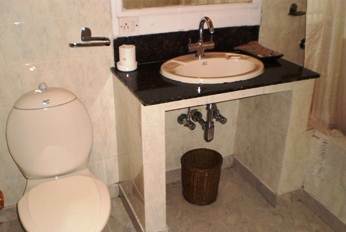 Bathrooms are standard with counter style wash basin. There is a shower mixer and geyser in the bathrooms for 24-hour hot and cold water. There is a restaurant in the ground floor. Although the menu is not elaborate, it serves Indian, Chinese and Continental dishes for in-house guests only. The hotel offers different kinds of meal plans like AP, MAP etc where breakfast and other meals are include as part of the room rates. Being a bit isolated and not having any restaurants nearby, you will be better off to combine your meals along with room rates. The restaurant has started sourcing vegetables from an organic farm called Dzahuna Enviro which is run by its sister concern. The ingredients used are fresh. The dishes prepared are quite nice and you will need to order your food in advance (particularly so during the low season). Dinner needs to be ordered by 6pm. The menu changes frequently. Some of our favorite Indian dishes here are steamed rice, dal, green salad and shredded curried chicken. 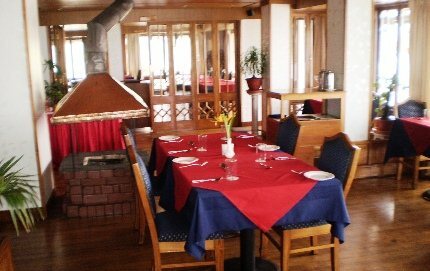 The restaurant also serves local (Himalayan) cuisine. However you will need to tell them well in advance. There is a Grand Piano. During the high season, a local musician plays the piano every day in the evening adding to the overall ambience. As you sit in the lobby or the restaurant, the sound of the piano playing at the background lights up the spirit, it feels wonderful. There is a bar known as 'Bar of Paradise' which has good selections of liquor, beer and wine. They keep both Indian and imported spirits. During the low season, the bar usually opens on request. It stays open until 9pm. You can however have a wine or beer served in the restaurant as well at the time of dinner. Outside the lobby at the ground floor, there is a lovely lush green lawn. There are wrought iron chairs with glass top tables that are laid out in the lawn. The lawn is circled with trees in all sides. There are also huts around the lawn with covered seating. Another highlight of Cedar Inn is the open Terrace Cafe. 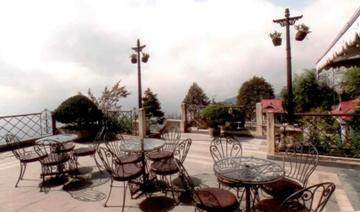 This is an ideal place to enjoy the panoramic views of the mountain range and Darjeeling town's landscape as you enjoy a cup of Darjeeling tea and snacks. An in-house gift shop in the hotel has nice collections of souvenir and ethnic gift items like local handcrafted items, post cards, Darjeeling organic tea gift packs, shawls and many other items. There is also a library that has nice collections of books and journals. You can also surf the net from the internet points available at the lounge. Other amenities includes Table Tennis room (small and very basic though), conference room accommodating 80 persons and offering fully equipped conferencing facilities, free shuttle to and from the town center, sightseeing & transportation services, housekeeping, laundry service, doctor on call etc. The hotel also offers free car parking. Update March 2014: A new Spa has been added recently having separate rooms for men and women, and offering different kinds of massages and treatments. 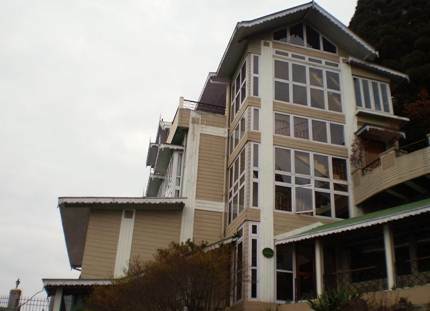 Cedar Inn is one of the unique resorts in Darjeeling which has its own large water treatment plant. It stores rain water in underground reservoirs and then purifies it through the water treatment system and then supplies it to the rooms. In off season, this water supply is enough to cater to entire hotel's water requirement. This way the hotel is able to counter the water scarcity problems in the hills. Check in Time: 1pm, Check out: 11am. 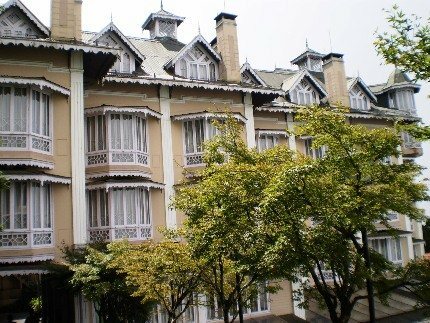 Cedar Inn is located at the extension of Zakir Hussain Road which is also known as Jalapahar Road and just below the famous St. Paul's School of Darjeeling. It is in a quiet and secluded area with mostly residential houses around and away from the noises of the town center. It takes about 25 minutes to walk down to the Chowrasta Mall from the Hotel. However the hotel provides a free shuttle to and from the town. Cedar Inn, Jalapahar Road, Darjeeling 734101, India.